This blog post is from Joan Murray, Director Emeritus. Billiard Room. Image courtesy Parkwood Estate, copyright the Challener estate. 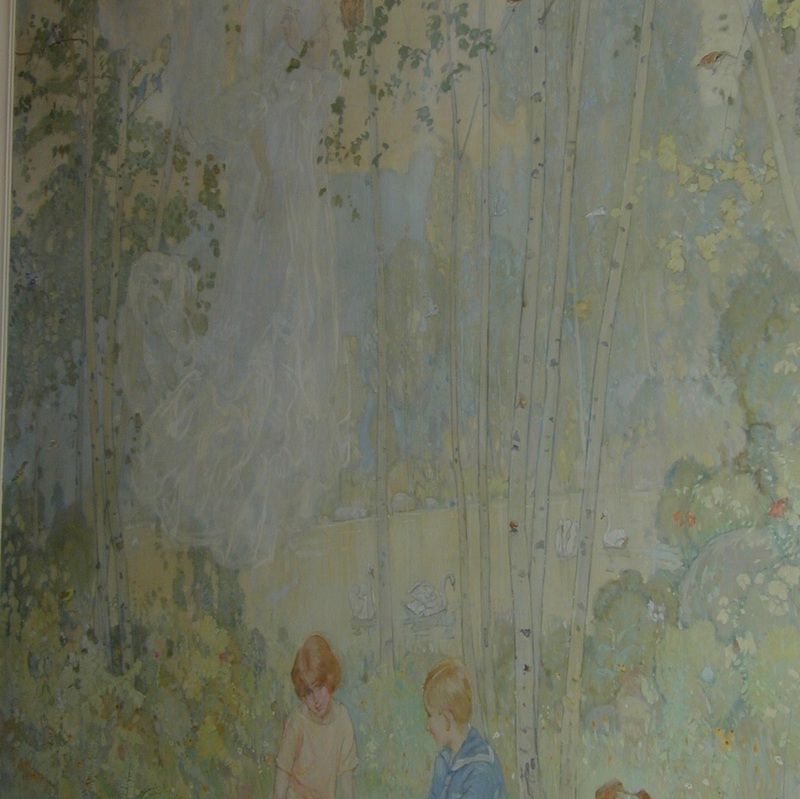 Frederick Sproston Challener’s inspired mural paintings in Parkwood Estate, commissioned in 1924, are particularly well done. Located in the billiards room and hallway, the murals have a strangely perfect, yet ineffably wry quality which combines romanticism and history. His narrative includes the five daughters of Colonel Sam McLaughlin, including the patron of the Gallery, Miss Isabel McLaughlin, outdoor sports events engaged in by Mr. McLaughlin and his family, and a vision of arcadia with wholesome-looking young children, McLaughlin’s grandchildren. The entire effect is joyous, with just the right mixture of Twentieth-century details to balance the artifice before us with its woodland setting of birch trees and panel of Pan playing his pipe. Enchanted Wood. Image courtesy Parkwood Estate, copyright the Challener estate. Challener was an artist who returned from a trip to Europe in 1898-99 with a passionate desire—to make murals. Fortunately for him, his wish fell in with a period of expansion in the theatre and architectural scene in Canada and he soon found himself hard at work executing murals in Toronto, Ottawa, Montreal, London, and Winnipeg. At the same time as his architectural commissions, he painted many easel paintings. In celebration of McLaughlin Day, we honour here not only Colonel Sam McLaughlin and his wife Adelaide, but Miss Isabel McLaughlin, who was always deeply interested in mural painting, as well as the McLaughlin family, our friends. Click to read more about the basement tours.